With temperatures projected to be in the low 90s on Oct. 4, 2014, it was an easy decision to celebrate Elijah Belden’s 10th birthday with a pool party at the family home in Temecula. Friends and Elijah’s baseball team joined him on this special day, but in an instant, the upbeat celebration took a terrifying turn. Just after having his picture taken, Elijah touched a metal support pole for the patio cover and immediately collapsed, unconscious. It was believed that the pole had become electrified by outdoor decorative lights. Slouched awkwardly against the structure, Elijah was in cardiac arrest. Not realizing Elijah’s arms were locked around the pole, his mother, Aly, jumped to help him and got shocked too, although not seriously. Party guest Scott Baker, an off-duty Orange County deputy sheriff, stepped in and was shocked as well. He then pushed Elijah off the pole, and Elijah fell backwards, striking his head on the concrete. He had no pulse. Aly, who had recently completed CPR training, knew the most important thing to do was to get her son’s heart beating. She and Baker began to perform CPR until first responders arrived. Now breathing but still unconscious, Elijah was transported to an area hospital where he was intubated and put on a ventilator. Although he regained his pulse and blood pressure, Elijah remained unresponsive. To prevent damage to his brain, the team cooled Elijah’s core temperature using therapeutic hypothermia. Often done in cardiac arrest cases, a cold saline solution is injected or ice packs are placed on the body to increase the chance of a full recovery. Elijah was airlifted to Rady Children’s Hospital-San Diego, where he was rushed to the pediatric intensive care unit (PICU) in critical condition. Right away, Bradley Peterson, M.D., senior consultant at the Ernest Hahn Critical Care Center and medical director of Children’s Hospital Emergency Transport team, realized he was dealing with a unique situation. Elijah’s body temperature was again cooled, and he was placed in a medically induced coma to help control his intracranial pressure. Keeping a close watch on that and other measurements was essential to his brain’s recovery. Electric shock can cause serious physical problems, including severe burns, impaired brain function and heart damage, as well as mental challenges, such as depression, anxiety and personality changes. Amazingly, Elijah came out virtually unscathed. After eight days in the medically induced coma, Elijah woke up and soon after, he was breathing on his own and slowly coming off his medications. He was released from the PICU and started inpatient rehabilitation, including physical and speech therapy. Dr. Andrew Skalsky, chief of the division of Rehabilitation Medicine at Rady Children’s and an assistant professor of pediatrics at UC San Diego, remembers Elijah’s initial assessment. Elijah’s recovery was so quick that a mere three weeks after the accident, he was doing what he loves most: playing baseball. Today, one year after the accident, the 11-year-old is excelling academically and shows no physical or mental side effects from the accident. 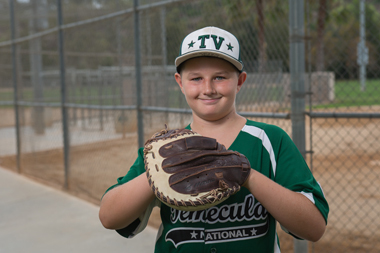 After his Temecula Valley Little League team won the divisional spring championships this year, Elijah was drafted to the Temecula Valley All-Stars. Both teams were coached by Baker, the deputy sheriff who pushed Elijah off the electrified pole. Realizing the importance of CPR in Elijah’s recovery, the Belden family and several of theirneighbors completed CPR training earlier this year. Future plans include a CPR training fundraiser to raise money for the installation of automated external defibrillators at local parks. Tony also hopes to bring basic CPR training to the upper-grade classes at his son’s school. “We want to use the positives of Elijah’s story, challenging others to be informed and to be trained to take action when it’s needed,” he says. Electrical hazards are everywhere, but parents can help prevent injuries by making theirhomes safer. A study by the Electrical Safety Foundation found that at least seven children each day are treated in an emergency room for severe outlet-related injuries, including electrocution and burns. Install outlet covers to prevent babies and small children from sticking their fingers and other objects into outlets. Use a cord organizer to keep extension and power cords neat and out of sight from babies and small children who may be tempted to chew on them. Electrical burns to the mouth account for half of the extension-cord-related injuries to young children, according to the U.S. Consumer Product Safety Commission. Don’t use or leave radios, hair dryers or any other electrical appliances near water. These devices will automatically shut off a power circuit when it detects an improperly fluctuating electric current. GFCIs are an easy, budget-friendly way to prevent electrical injuries and house fires. For more safety tips and an informative “Home Safety Makeover in a Day” video, click here.